NATURAL HABITAT AND PREFERRED SITE: Shumard eastern red oak grows in the 1/3 of the state in a wide range of soils from sandy to heavy clays to solid white rock outcropping areas. It adapts to most any soil that it well drained. IDENTIFICATION INFORMATION: Red oak is a graceful, majestic, tall-growing and wide-spreading shade tree with beautiful fall color and lovely deeply cut leaves. Fall color can range from yellowish-browns through yellows and reds to deep maroons. Typically has no central stem although I have seen some true shumard red oaks with central stems. FLOWERS AND FRUIT: Male and female flowers (catkins) on the same plant (monoecious). Rust colored male flowers hang from terminal growth in the early spring and female flowers bloom singly or in small clusters. Fruits are medium to large acorns, generally ¾ to 1 inch long to ½ to 1 inch wide. They mature in the fall of the second season, singly or in pairs. 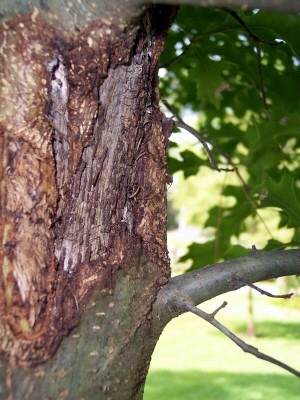 BARK: Young trees have light to medium gray and very smooth bark. It darkens with age and develops a heavy texture. FOLIAGE: Leaves are simple, alternate and deciduous with fall color ranging from yellows to reds and even deep maroons. The only way to be sure about the fall color is to buy plants in the fall to try to get the bright red colors. Even then the fall color will vary depending on the soil and weather conditions. Leaves are deeply and gracefully cut with pointed tips. CULTURE: Red oak is fast growing, especially for such a high quality tree, requires a minimum amount of fertilizer and moderate moisture. It is sometimes hard to establish from transplanting and can be easily over or under watered. Once established it is an easy to maintain and drought tolerant tree. PROBLEMS: Red oaks can’t stand wet feet. Poorly drained soil causes root disease, illness or death. Red oak are highly susceptible to oak wilt. Occasionally red oaks are bothered by scale, borers and other insect pests but that is always a symptom and related to a bigger problem of an environmental nature. Oak sawflies are fairly common, annoying pests that attack and skeletonize the leaves. Its damage is normally isolated in spots no larger than basketballs. Can be controlled by the Basic Organic Program and occasional spraying of Garrett Juice plus garlic. Another cause of problems is mistakenly buying pin oaks or crossbred trees. 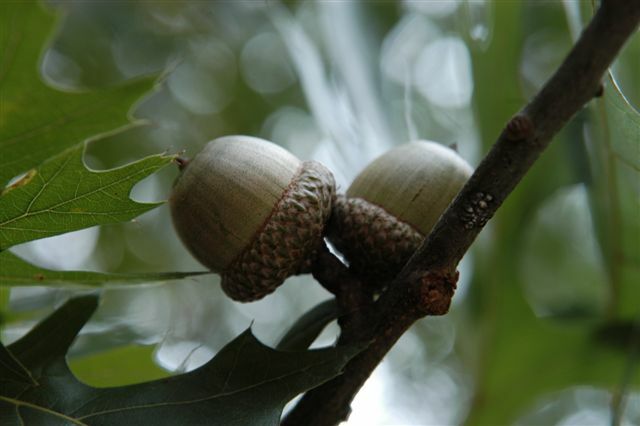 PROPAGATION: Propagation is by planting acorns in the fall just after they have fallen from the trees. INSIGHT: Red oaks are magnificent and graceful trees. They have always been one of my favorites but they are the subject of a large, confusing tree problem. Buying the right plant is not always easy. There are 3 red oaks that are very similar and will all work in the alkaline soils, Quercus shumardii, Quercus texana and Quercus gravesii is the Chisos oak. Benny Simpson in his book A Field Guide to Texas Trees explains the difference in them best by saying that the Chisos oak grows primarily west of the Pecos, Texas red oak grows west and north of the Balcones Escarpment and the White Rock Escarpment just west of Dallas and the shumard oak simply grows east of that line. Pin oak and crossbreeds of other trees such as southern red oak (Quercus falcatta) and northern red oak (Quercus rubra) cross breed readily with red oaks. If trees not adapted in Texas dominate the blood of the offspring, these trees when growing in alkaline soil, will be sickly with nutrient deficiencies, appear chlorotic and eventually die. The northern red oak doesn’t do very well anywhere in Texas. The southern red oak grows very well over in the deep east Texas acid sandy soils and the same goes for pin oak. Some folks still recommend wrapping tree trunks with paper, gauze or other materials to allegedly protect the trees from various problems from sunburn to insect attack. Borers are warned about often. Wrapping tree trunks not only doesn’t help the tree, it actually encourages weak bark, disease and insect attack and of course wastes your money. See the front of the book for the proper planting instructions which apply for all trees but especially for red oaks. 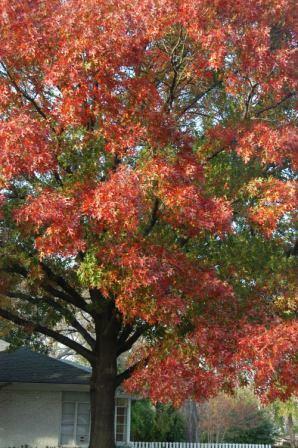 ANSWER: Many red oaks lost leaves early last fall. Heavy rains in the spring followed by intense heat and humidity caused it. Spraying the foliage next year with compost tea or Garrett Juice should help reduce leaf drop. ANSWER: It looks like animal damage, which can cause severe injury to trees or shrubs. If the damage is all the way around the trunk, the chances are the tree will not survive. Apply the Tree Trunk Goop to the wound and to burlap wrapped around the wound. To prevent this problem in the future, increase the health of the soil and the tree by following an organic gardening program. A photo you sent indicates that this tree is planted at least 6 inches too deep. 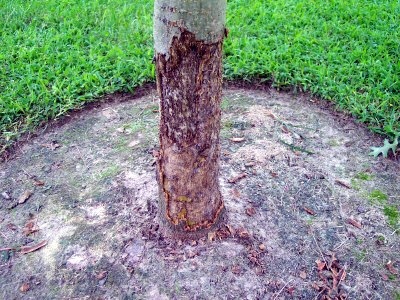 Its root flare should be exposed, and any circling and girdling roots should be removed.